The first point is to understand the static method of setting the ignition see below…. Static timing is done with the ignition ON, the engine is turned by hand to the static setting using the timing pointer on the engine and a mark on the crankshaft pulley on most engines and stopped in this position. 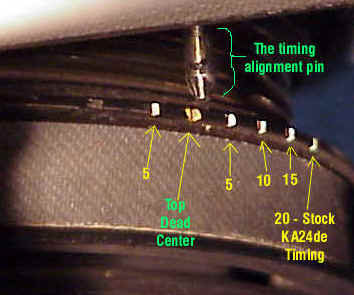 The marks are shown below “The timing Alignment pin” is the pointer on the engine and the white marks 5 TDC 5 10 15 etc are on the pulley. So looking below at the photograph (remember the pulley rotates clockwise so it’s gone past the timing alignment pin 10 and 5 and you can see the setting is between 5 and TDC ) say 2 degrees. It’s a guess especially if you can’t get your head directly above the pointer, like below, to line them up accurately. If the engine has been turned and is stationary at this position all you have to do is turn the distributor until the points just open, you can use a light or watch for the small spark at the contact points. The distributor will be set at say 2 degrees or so you think. However when you start it up and check with a strobe you may find its actually set at 4 degrees or anything +/- 2 or 3 degrees, because the mark alignment is a guess and the distributor when its turning gives a different setting at idle, when the engine is ticking over. Basically the static setting is inaccurate. Anybody who uses a strobe and dyno knows that the static factory setting just a guide for the average engine, and since engines vary and wear, each engine must be optimized by dynamic setting. The electronic kit ignition timing setting needs adjusting using a strobe light. You can find out how to do that with a Powerspark Timing Light here. It is always good practice before removing the old distributor from the engine or removing the points to fit the electronic kit to turn the engine to TDC No1 position and confirm the position of the rotor arm that should align with No1 plug lead. The electronic ignition module has been designed and fitted to the base plate so it can be easily fitted in place of the points. However because each distributor is different due to manufacturing tolerances, the base plate with the module firing position set as near as possible to the same position as the points were, the distributor will possibly have to be turned +/- 5 degrees from where it was clamped with points. Setting the timing dynamically is recommended once you have fitted one of our electronic kits. We can offer strobe timing lights that are very easy to use. There is no easy way to see or hear when the black trigger is in the firing position with the red module that compares with the contact points just opening. A spare spark plug can be used fitted to the end of No1 lead, resting on the engine with a good earth, the static timing position can therefore be checked when the engine is turned over by hand. This is not a reliable method and can depend on the earth and type of plug. If you are able to set the engine to its correct static advance position ( or you are sure it is running with this position currently ) you can simply fit the electronic kit to the distributor still in the engine and the timing will need very little adjus ent from this position to optimize the dynamic timing. Distributor removed from the engine. The Powerspark electronic kit can be fitted to the distributor on the bench the same way as if it was installed in the engine. Turn the engine to TDC No1 position and confirm the position of the rotor arm that should align with No1 plug lead before removing the distributor with the points. The setting can be done by observing that the black trigger ring has individual magnets inserted in the plastic and one of these need to be aligned with a faint shadow that is present on the face of the Powerspark red module. The static firing position that corresponds with the rotor arm in No1 position can then be achieved by turning the distributor to this position before the distributor is clamped in position. We do recommend final ignition timing to set dynamic using a strobe. New Electronic Distributor purchased, red conversion kit installed. Before removing the old distributor from the engine turn the engine to TDC No1 position and confirm the position of the rotor arm ( should align with No1 lead ). Fit the new distributor and confirm the rotor arm aligns with the No1 lead, leave the distributor clamp loose enough to turn the distributor once the engine has started and complete setting the timing dynamically and tighten the clamp.